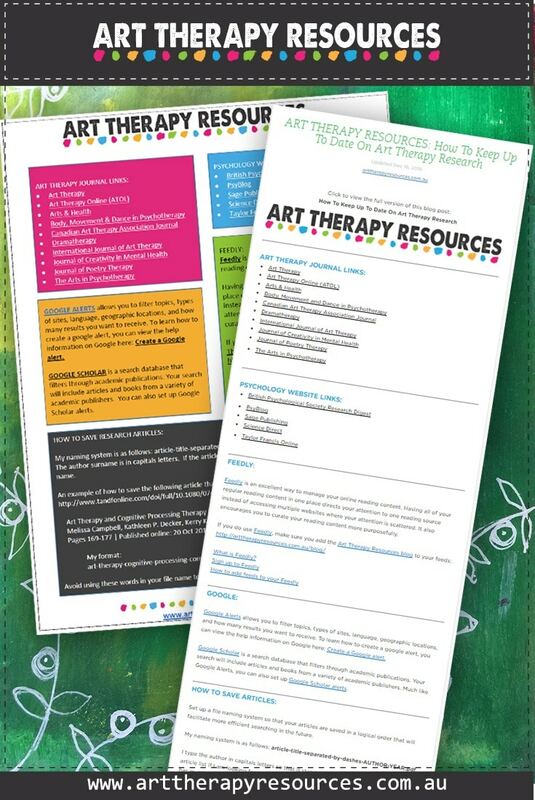 Staying up to date on art therapy and psychology research provides a number of benefits to your art therapy practice and overall professional development. 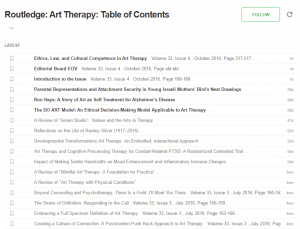 You may like to read research that is focused on art therapy only, or follow research on a specific diagnosis that you specialise in your practice. You can use technology to deliver research content to you in detailed or summary form. This can save you an enormous amount of time and help you avoid going down the rabbit hole of endless googling. 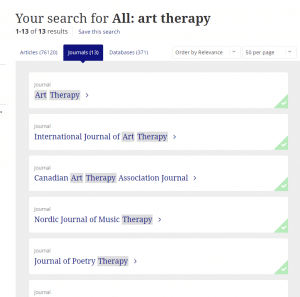 Included in this article is a number of useful websites to find art therapy research and general psychology research. I’m also going to introduce you to an app that will help aggregate useful articles for you. Also included is an introduction to Google alerts, which includes tapping into Google Scholar as a resource for research. Finally, I’m going to show you a streamlined system to save articles in a way that will increase your productivity when you need to access them in the future. Most of the above journals are published by Taylor Frances Online. You can create an account on their website and stay up to date on each issue released. Below you can see how an account is created and then how to subscribe to alerts for journals, as well as create a saved search. After you have created your account, do a search for art therapy. You can see below that my search resulted in 76,120 articles, 13 journals and 371 databases. Those numbers will change depending on when you register your account. I was primarily interested in the Journals, so I clicked on that button and was shown a list of all journals available – screenshot below. You will then be taken to a page like below. Press the FOLLOW button in the right hand corner and you are now subscribed to this feed. It’s important to note that all you will receive in your feed is the title headings as shown below. You will then need to access the original website of the journal to access the content. Using Feedly in this way is a simple way of providing you with basic article headings so that you can make quick decisions about whether you would like to read further. You are then prompted to give your search a name and nominate if you would like to receive alerts and how often. I chose MONTHLY as my frequency. 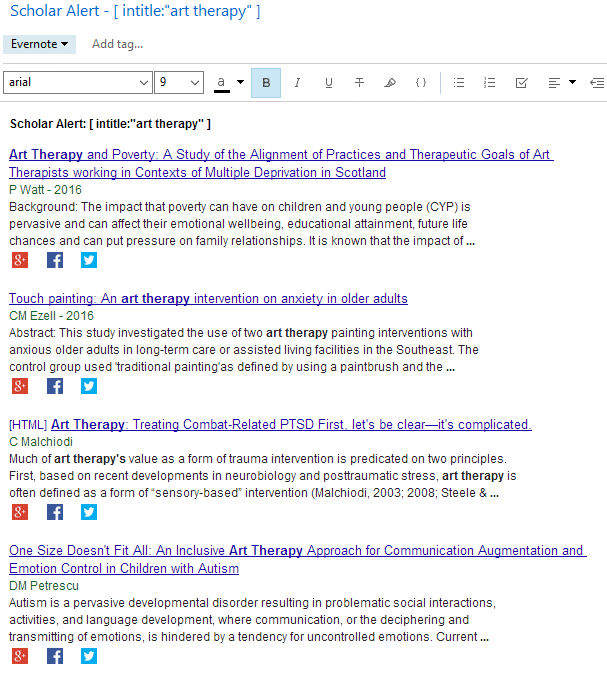 On the left hand side, click on New content & citation alerts and you can see the alerts you are subscribed to. 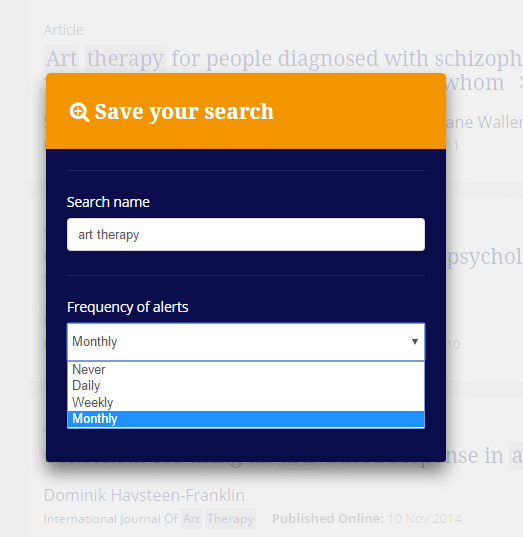 From this screen you can also delete any journals if you prefer to no longer receive alerts. Make sure you change the frequency of alerts if you prefer to be notified more or less. Feedly is a news aggregator application. If you have not come across this type of app or terminology before, imagine you are creating your own magazine containing a collection of different blogs and websites that you regularly like to read. Within the app, you add the link to your chosen blog or website and the app will display the latest content from that website. This means you can use this one app to read your content, instead of having to visit the blogs/websites individually. Feedly has a free and paid version. The free version contains a decent range of features to read, categorise and share. The Feedly paid version provides integration with other software such as Evernote, OneNote, IFTTT, Hootsuite and LinkedIn. It also has more sharing features. The cost of the pro version is currently $7 USD per month/$65 USD per year. Feedly often has promotional deals that could save you up to 30% off this price. I have used the free version for over 3 years. I use Feedly every day and the free version has always suited my needs. Feedly runs on your desktop computer through your browser, or on your mobile device. You can access your articles across multiple platforms. You can enter the URL of a blog/website directly or you can search for a blog/website within the app. You can organise your reading material by creating categories. For eg, you could create categories like Art Therapy, Psychology, Business Online, Marketing, Social Media, Productivity, Personal etc. Google Alerts aggregates information like Feedly does, however, it only aggregates links and not entire articles. With Feedly, you can read the articles within the Feedly app, whereas Google Alerts, sends you a curation of links which you can only read on each website where the original content is located. Google Alerts allows you to filter topics, types of sites, language, geographic locations, and how many results you want to receive. To learn how to create a google alert, you can view the help information on Google here: Create a Google alert. Google Scholar is a search database that filters through academic publications. Your search will include articles and books from a variety of academic publishers. Much like Google Alerts, you can also set up Google Scholar alerts. I arrange my google scholar alerts to be emailed to my Evernote account which ensures my email inbox isn’t cluttered with a list of reading material. My google scholar alert looks like below in my Evernote account. The information includes a clickable link, the author’s name, the year, and a brief synopsis of the article. 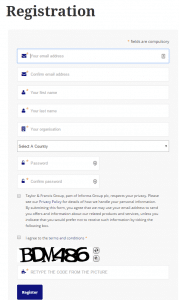 Most publishers provide access to research articles for a fee, however, you may be able to find the article online (legitimately) for free instead. The link took me to the ProQuest website where I was provided with an abstract and a link to purchase access to the article for approximately $40 USD. Instead of purchasing the article, I googled the titled with ‘pdf’ on the end and was provided with a website link where I could download the article for free (a legitimate source). I’ve included the links below so that you can see the complete article (thesis) for free. Enter search term into your browser: Touch painting: An art therapy intervention on anxiety in older adults pdf. Unfortunately, this kind of access isn’t the case for every article you may want, but I’ve found there are accessible free copies available in a lot of cases. Once you’ve found your document, you might want to consider how you store and save the article. At university, I used EndNote for citations and generating a Reference List. I saved all of my articles to one folder on my computer hard drive and then imported the information into EndNote for search and citation purposes. Outside of research, I still save the articles to my hard drive, however, I don’t use EndNote as I don’t need to utilise the citation features. Over time I developed my own file naming system so that my articles are saved in a logical order that will facilitate efficient searching in the future. Prior to this naming system, my original method is best described as document chaos. I would spend too much time scrolling and opening and closing documents, only to find it wasn’t the document I was looking for. This prompted me to use a more organised process of file naming. I include the dashes because they act as delimiters when importing information into excel which will enable me to manipulate file handling if I need to in the future. I type the author in capitals letters so it can be easily distinguished from the title as I’m scrolling through my article list when looking for a specific author. I only use the surname and if the article has multiple authors, I only use the first author’s surname. I am selective with the words I use and in this case, I excluded the word ‘and’ from the filename. So far I’ve been glad I set this file naming system up as it has saved me a lot of wasted time searching documents. You can come up with your own system, however, it is important to remember, the search benefits occur from being consistent with your naming system. Research articles can often be taxing to read as the articles involve psychological and statistical terminology. I read the abstract and then decide if I want to explore the article further. I am mindful that my time is limited and that affects my decision on whether to use only abstracts as a brief update or a complete article. Many of the research articles online belong to publishers who charge for access to the article. Some publishers offer the articles for free. For those who charge, I read what I can from the abstract information and google for any further information. I also use my university login (as alumni) to access scientific databases. My university offers Alumni access to databases at no charge. It is important to constantly curate your alert list to ensure that you are not overwhelmed with alerts. I once subscribed to a psychology website that published about 30 articles every day. Every time I logged on to my Feedly account, I was overwhelmed at the number of articles to review. If I skipped a few days, the number would be compound and before I knew it, I had 300 unread articles which I had no chance of ever reviewing. I decided to unsubscribe and be more selective about the alerts I signed up to. 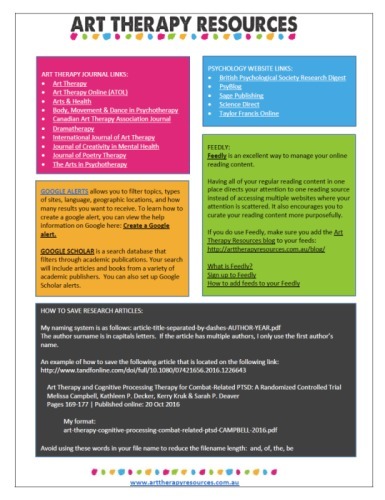 You can download a summary list of the useful links and tips to keeping updated on current research. You can also access this Evernote document which contains the same tips. You can save this note to your own Evernote. You can view the Evernote document even if you do not use Evernote.